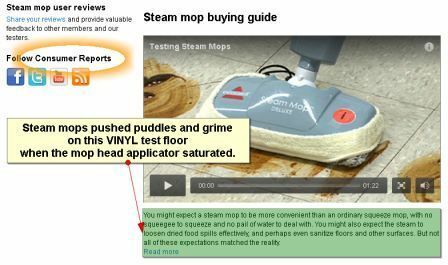 Steam mops failed to beat wring mops in a major consumer agency's side by side testing on this heavily soiled vinyl floor. Both mops introduce way too much moisture to a wood floor surface. not on the steam, but the mop's applicator, which is low grade microfiber. High quality microfiber mops are how to clean hardwood floors, even sanitize hardwood floors without risk of water damage. Boiling water is just another way of dispersing and dispensing it. and with a saturated mop head applicator, that means steamed water is pushed past the applicator to the floor, itself. Puddles form with no absorbency left in the mop to pick it back up. More and more people are arriving at the conclusion that the best wood floor finish for them is NOT a polymerized top coating. If your floor is protected with a soft wax, expect excess moisture to cloud the surface much like a cup will leave a ring on fine furniture. the clouding issue. These products are not left on the surface to discolor. But your wood might turn gray. That's how wood responds naturally to excess moisture. if you do steam, it may simply mean re-oiling a little more often. cleaning must require minimal moisture, if any.